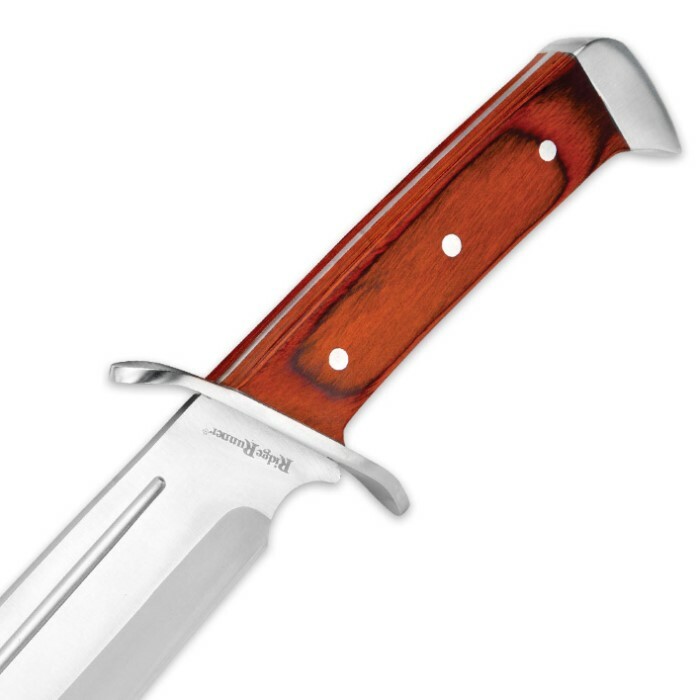 Ridge Runner Renegade Bowie Knife | BUDK.com - Knives & Swords At The Lowest Prices! 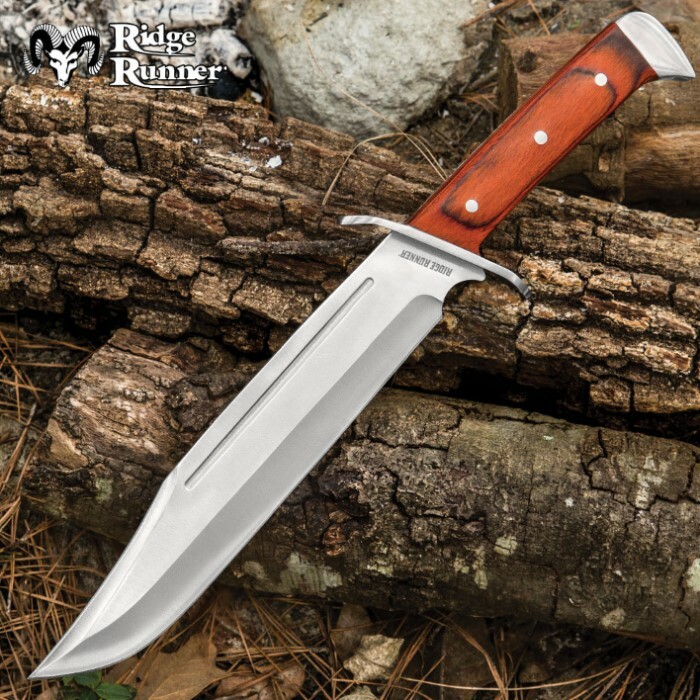 The Ridge Runner Renegade Bowie Knife is a gargantuan fixed blade that is unbeatably tough. It features a whopping 9 3/4” stainless steel, full-tang blade. The handsome pakkawood handle has silver pins that not only secure the blade, but also accent the handle. The pommel and guard are of stainless steel. A nylon sheath with a belt loop houses the mighty blade and the bowie is an impressive 15 1/2” in overall length. Is 1 bad boy here !! Craftsmanship and sturdiness of this knife is unbelievable !! This knife came sharp enough to split hairs !! Exstreamly pleased about this purchase Budk strikes again with a quality product at an incredible price !! Beautiful Blade As Always. For All My Knives I Go Too Bud-K .....Just That Simple. The Bowie knife was just what I wanted & thought it would be! Heavy Duty, excellent Craftsmanship and Great price! Get the matching Parang! This knife looks and feels great. Quality knife at unbelievable price. Out of 6 knifes I purchased, this one was my favorite. This knife is unbeatable for the price and extremely well built! Why buy a $70.00+ knife when you can get this $13 gem! Use it keep it with you buy several keep on in your vehicle the great thing is this will do the job and if lost you didn't break the bank! I own four and will get more as they make awesome gifts for like minded folks! If you need a large Bowie knife this one is it! I ordered this knife just to add to my order to get free shipping. So glad I did. It is a gorgeous knife. It has a beautiful woodgrain handle. I got it engraved also. It looks really nice. Great knife and good service! Great price , large knife, fit and finish , nicely done. Great large Knife, little bit of brown putty filling the gaps in the handle to the blade but for the price you actually cant be mad. hope it holds up in the woods. will update when its had some use. Love these classic Bowie knives.